Product #15856 | SKU XDJ-R1 | 0.0 (no ratings yet) Thanks for your rating! The Pioneer XDJ-R1 Wireless DJ System lets you enjoy DJ play with the iPad, iPhone, or iPod touch. It is a suitable DJ system for the home DJ, and provides support for diverse media and music formats. It features Beat Sync function for one-touch beat synchronization of 2 songs. A dedicated application, which is downloadable from App store, needs to be installed on iPad / iPhone / iPod touch for control of XDJ-R1. The AUTO BEAT LOOP function operates with music that has been tempo-analyzed (BPM: Beats per Minute) using the included rekordbox software. Operates with music that has been beat-analyzed using the included rekordbox software. The Hot Cue function enables instant playback from a previously specified point, simply by pressing a button. Each player can set hot cues at 3 points. The 4-Beat Sampler function makes it possible to play recorded sampling sound sources simply by pressing a button. Sound sources can be recorded from songs on USB storage devices and CDs. Diverse forms of DJ play can be enjoyed by selecting from 4 effects (trans, flanger, echo, and roll) for each song played on each player and changing BPM and effects levels. Diverse forms of DJ play can be enjoyed by selecting from 4 effects (filter, crush, pitch, and noise) for each song played in each channel. 3 Beat FX function operates with music that has been tempo-analyzed (BPM: Beats per Minute) using the included rekordbox software. Quantize function operates with music that has been beat-analyzed using the included rekordbox software. DJ play can be performed using a diverse range of media and music formats, including music CDs and file formats such as MP3, AAC, WAV, and AIFF stored inside USB storage devices or recorded onto the CD-R/RW. The XDJ-R1 DJ System also provides MIDI support and can be used to operate various pieces of DJ software. Free download of Atomix Inc.'s Virtual DJ Limited Edition DJ software is available. This software features an original GUI design that is easy to use with the XDJ-R1 DJ System, and enables optimum enjoyment of various DJ play styles with features including loops, effects, a sampler, and 4-channel mixing. The unified structure of 2 players and a mixer means users can DJ with this device alone. 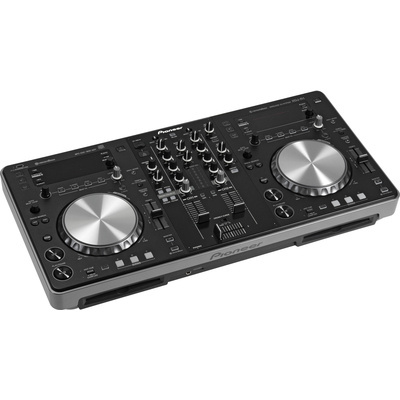 The mixer part is equipped with ports for the connection of external hardware such as CDJ players and turntables, etc., so it can also be used as an independent 2-channel mixer. A combination of all kinds of effects enables simple performance of a wide range of music arrangements and mixes. Hot Cue: The Hot Cue function enables instant playback from a previously specified point, simply by pressing a button. Each player can set hot cues at 3 points. 4 Beat Sampler: The 4-Beat Sampler function makes it possible to play recorded sampling sound sources simply by pressing a button. Sound sources can be recorded from songs on USB storage devices and CDs. Beat FX: Diverse forms of DJ play can be enjoyed by selecting from 4 effects (trans, flanger, echo, and roll) for each song played on each player and changing BPM and effects levels.